Interested in a stunning, scenic mountain vineyard tour and tasting? 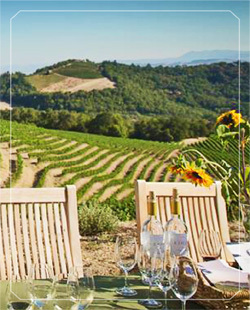 Our private vineyard tour and tasting is the experience you’re looking for. Enjoy our wines and cheese pairings while taking in the spectacular sights of our mountain vineyards. $80 Per person. Please allow 1 1/2 — 2 hours for this visit. By advance appointment only. A private tour and tasting in our mountain vineyard. Guests will taste four of our wines complemented by artisanal cheese selections, while enjoying sweeping views of the Mayacamas Mountains and San Francisco Bay. We offer this experience daily. Secure your reservation by credit card 48 hours in advance. We require a 24 hour notice for any alterations or cancellations. Please contact us at 707-938-7292 or by email at info@kamenwines.com to schedule your visit.